Featuring performances by Magnetic North (NY), Nomi of Power Struggle (Bay Area), Michelle Myers of Yellow Rage (Philadelphia), Maria Isa, Blackbird Elements, Guante, Rodrigo Sanchez-Chavarria, e.g. bailey, Tou SaiKo Lee with PosNoSys, True Mutiny, Shá Cage, Kevin Xiong with Pada Lor, Tish Jones, Maipacher, Logan Moua, Bobby Wilson, Poetic Assassins, Hilltribe, and special guests. Tou Ger Xiong and Amy Hang will emcee and DJ Nak will be on the one’s and two’s. $5-$10 suggested donation. 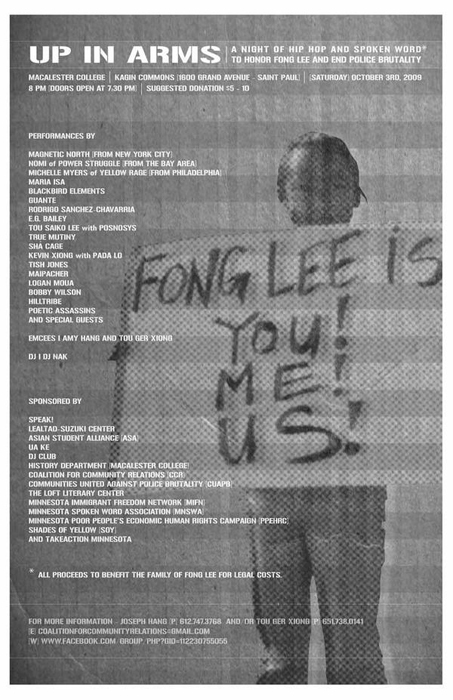 All proceeds go towards legal costs for the Family of Fong Lee. After a capacity-bursting show at the Nomad in January, and an inspiring all ages show at District 202 in March, Hip Hop Against Homophobia is coming back to the West Bank, bigger and better than ever. We’ve got a whole new line up of queer and ally MC’s and performers, and proceeds will benefit three hard working organizations. Hip Hop Against Homophobia will bring together the Cities’ queer and hip hop communities for an event that combines our incredible music scene with change making and community building. It’ll go down so smooth, you won’t even know it’s activism. 7pm in the Fireplace Lounge: Open community conversation about hip hop and homophobia, queer hip hop artists, hip hop as social justice, gender in hip hop, queer movements for economic and social justice, whatever we want to talk about. Come set the agenda. Sai Werd Ink artists Poetic Assassins enter the second season of their hip hop theatre production “Eliminating Oppression One Ink Shell at a Time” at the historic Old Arizona Theatre. The Poetic Assassins are winners of the 20009 VERVE grant and are a dynamic spoken word duo dedicated to creating positive change in the community. The play follows the two as they use their words to “assassinate” the evils in the world such as: homophobia, racism, sexism, gender roles, prison industrial complex just to name a few. It is followed by a rhyme and reason session were the audience is invited to ask questions of the artists and engage in dialogue about the complex issues presented during the play. Featuring Verse, B.U.G.S., Crystal Ruiz, Adrian Waters, Jake Virden. This production runs for one weekend only. Tickets are available at the door. Recommended for audiences 13+ due to language and content.